The rural community grew after the arrival of the Long Island Rail Road’s Main Line in 1842. Local industry prospered, particularly the manufacturing of bricks which were made from the natural clay and sand in the lower Half Hollow Hills. In the late 1800s, millions of locally-made bricks were shipped by rail for use in New York City. Then known as West Deer Park, the first railroad depot was built in 1875. It has been reported that the station name was changed from West Deer Park to Wyandance to dismiss confusion with Deer Park. However, some historians report that the Post Office was changed to Wyandance at the request of the Wyandance Brick Company in 1888. 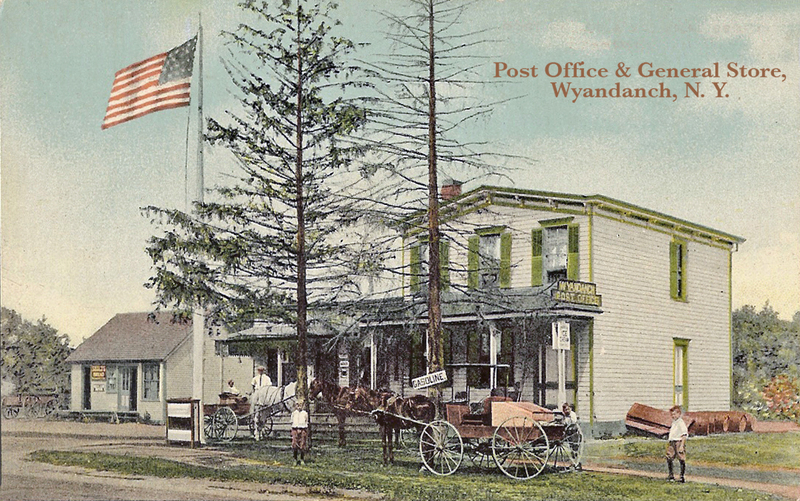 By the early 1900s, both the railroad and the post office were designated Wyandanch. Originally part of the Deer Park school district, the first Wyandanch schoolhouse was built in 1912, on the present site of the Wyandanch Public Library. Geiger Park was gifted to the Town of Babylon by real estate investor William Geiger, whose developments included Wheatley Heights Estates and Colonial Springs Park.